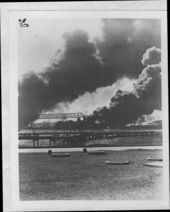 These seventeen photographs shows the bombing and destruction at Pearl Harbor, Hawaii. 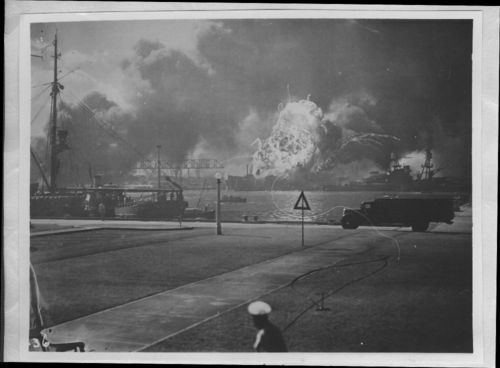 The surprise attack by Japanese aircraft brought the United States into World War II. 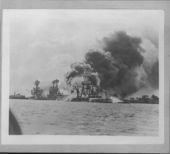 The attack demolished two U.S. Navy battleships, one mine layer, two destroyers, 188 aircraft, and killed 2,388 and wounded 1,178 personnel. Damaged warships included three cruisers, a destroyer, and six battleships. The Japanese losses were minimal. 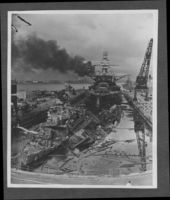 Attack on Pearl Harbor, Hawaii - The USS Shaw and Downs exploding in drydock.